HURRICANE – A 39-year-old LaVerkin man, Earl B. Chappell, has been arrested in connection with an attempted kidnapping Wednesday morning in which he allegedly displayed a gun and followed a Hurricane High School female student down the sidewalk outside the school, trying to get her into his car. The incident spurred an immediate lock-out for Hurricane area schools and a region-wide search for the suspect with the aid of many agencies. Photos and information obtained during the investigation led detectives to positively identify Chappell as the suspect involved in the morning incident, Hurricane City Police Sgt. Brandon Buell said. Chappell was located in LaVerkin, where he was detained without incident. He was questioned there and then taken into custody by Hurricane City Police with the assistance of the LaVerkin City Police Department. “The suspect was cooperative and compliant with Officers,” the Hurricane City Police Department stated in a release issued after the arrest. There is no indication that there was any connection between Chappell and the girl he approached, Buell said, and nothing to indicate that she was anything other than a random target. 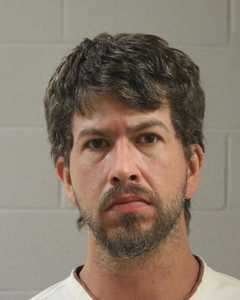 Chappell was booked on first-degree felony aggravated kidnapping, which applies when a kidnapping charge is associated with someone who uses or is in possession of a weapon. Bail for that charge is scheduled at $100,000. Chappell was also booked on a class B misdemeanor charge for possession of drug paraphernalia. The arrest was made within about 13 hours from the time of the attempted kidnapping. A lot of time and effort was put into resolving this incident, Buell said. His department’s entire investigation team gave a collaborated effort, he said, including Hurricane City Police officers and detectives and those who are school resource officers. Agencies from throughout the county and surrounding counties assisted as well, he said. Just prior to school opening we had a young lady come into our office and report to us that someone off-campus, as her father dropped her off, followed her down the sidewalk and tried to encourage her to come in his car. She came in the office very shaken up and reported that to us immediately. Six schools in Hurricane were placed on lock-out, which prohibited anyone from entering the schools without administrative approval. Shortly after 11 a.m., the lock-out was lifted and students were urged to use the buddy system as they left school and to be vigilant to report anything suspicious. Descriptions of the suspect were posted in news and social media. Over the course of the investigation, a suspect description developed characterizing the man as Caucasian; in his 30s to mid-40s; 5 feet, 6 inches, to 5 feet, 10 inches tall; 180-200 pounds; with a brown beard. He was said to be wearing a black beanie, dark blue or black jeans, a red shirt with a plaid jacket over it, and brown work shoes. We appreciate all the tips that came into our office and for the community coming together during this Incident. We also appreciate all the support and concern from the citizens of our community and that they are willing to take an interest into what is happening and working to help protect our children. But seems like a lot of Dixie girls like bad boys. We are missing a piece of this puzzle.